Noble: We’ve helped Hazard get a big pay day! 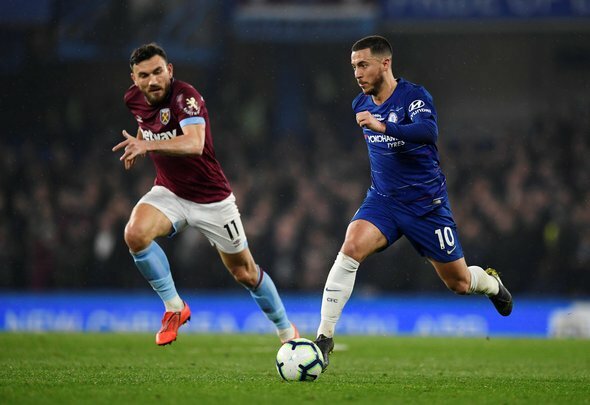 West Ham United captain Mark Noble has said that he and his fellow Hammers have helped Chelsea star Eden Hazard secure himself a bumper pay day. The Belgian international scored twice – the first an absolutely world class strike – as the Blues dispatched Manuel Pellegrini’s side 2-0 on Monday night. Noble cheekily claimed that the West Ham players have given the 28-year-old a helping hand by not being able to stop him. “Obviously Eden Hazard’s first goal stole the headlines at Chelsea on Monday and there’s not a lot we could have done about it,” he wrote in his Evening Standard column. “He doesn’t let you mark him, get close to him and when he has the ball he is deceptively strong. He has a low centre of gravity and is solidly built. Even when you kick him — I’ve tried once or twice! — you can’t get the ball off him. There were plenty of viewers watching on Monday and remarking ‘that’s another £10million onto the price tag’ when Hazard scored the opener with a sublime individual goal at Stamford Bridge. When you look at it that way, though, the only party the West Ham players have helped is Chelsea as a club. They’d be the ones getting the extra £10million, or Madrid would decide the price was too high and then the Blues get to keep their best player. Either way, win-win. However, in terms of the salary that Hazard could demand at Madrid, Noble might be right. When you produce world class moments of skill like he did on Monday, you are in a much stronger position to demand a boat load of cash in wages. Clubs pay a premium for top shelf talent and that will likely be the case when/if the Spanish giants bring Hazard in this summer. Noble’s not correct that the Hammers couldn’t have done anything about the goal, though. The defending was pretty woeful, after all. Still, let’s take nothing away from Hazard’s moment of brilliance.